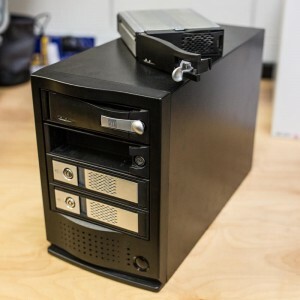 The ARC-8050 incorporated on-board high performance dual core 800Mhz ROC storage processor and with 1GB DDR3-1333 SDRAM memory on-board to deliver true high performance hardware RAID. Check out their website, they have it all spelled out. Some of the other manufacturers don’t have real detailed spec sheets showing whether they are bootable, JBOD capable, etc. 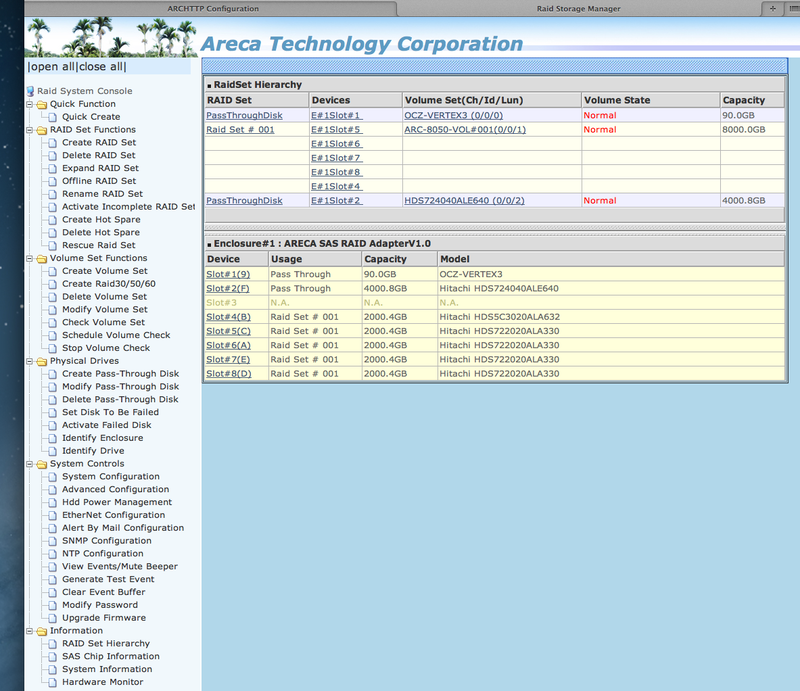 Areca’s was pretty clear. 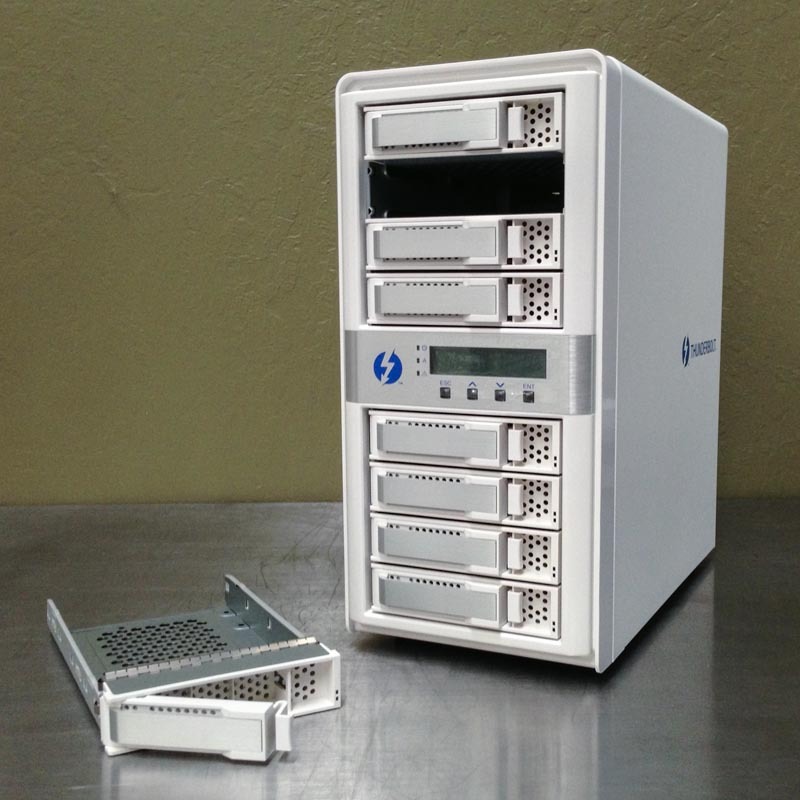 The drive trays have mounting holes for 2.5″ and 3.5″ drives. Seems like a nice piece of hardware. There were a couple of hiccups to get it going, which ended up being a default being set incorrectly. But from the first time it started up, there was a noticeable difference in operation and a feeling of reliability. The Pegasus box was just the opposite. We’ve had it running for about two months and haven’t had any issues. 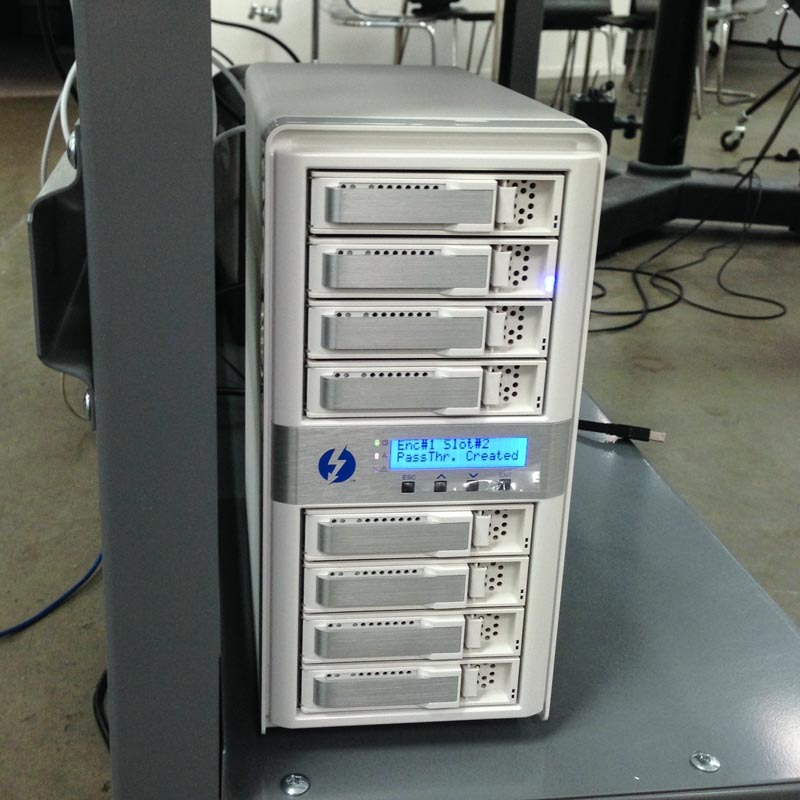 In the first bay we placed a 90 GB 6G SSD OCZ Vertex 3 to run the OS (running around 400 MB/sec read & write). The next bay has a HST 4 TB Time Machine SATA drive. Next bay is empty (may use for hot spare or add another drive to the RAID 5 array). 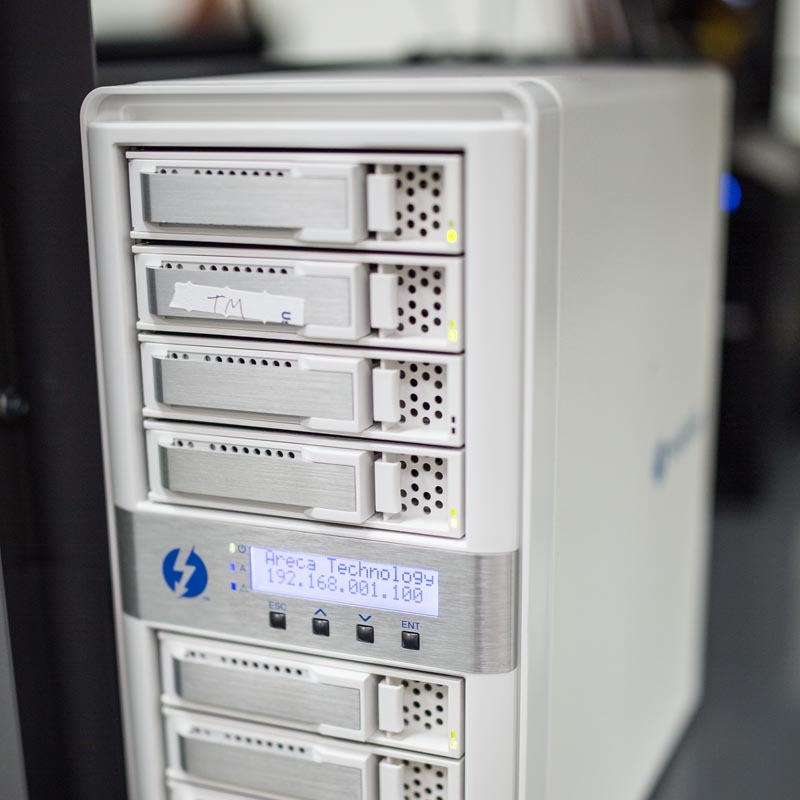 Then we have 5 2TB Hitachi SATA HD’s in a RAID 5 setup (these will be used for working still and video files, running around 415 MB / sec read & write). 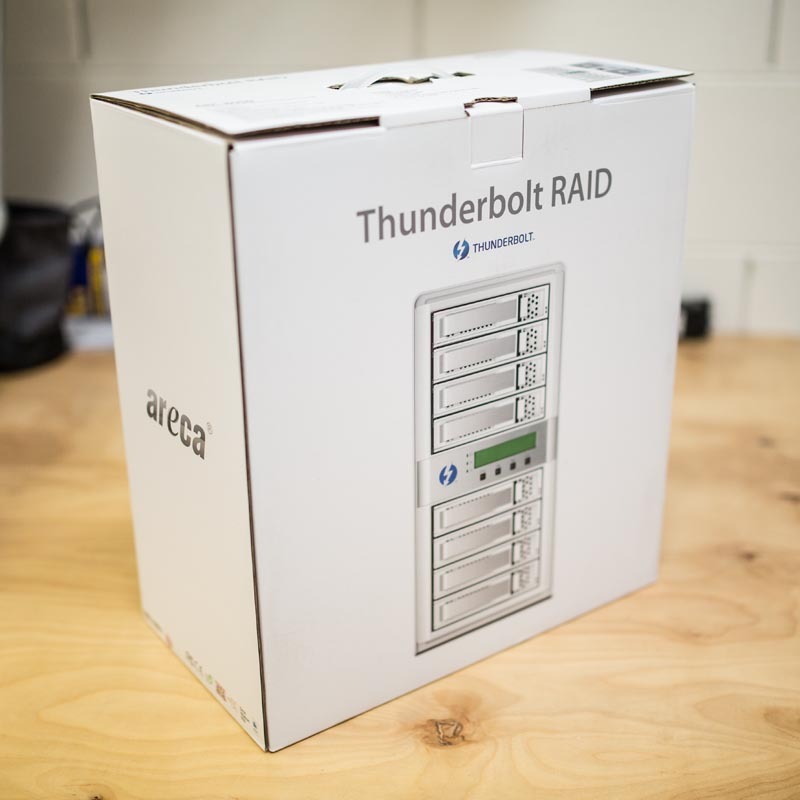 I still don’t trust the RAID 5 as a single solution for storage and backup. 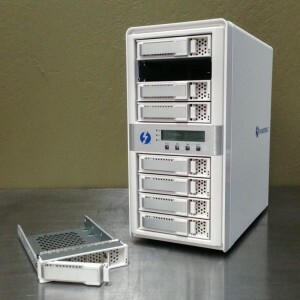 You still need at least two other copies of all data you don’t want to lose, one of which off site at all times. 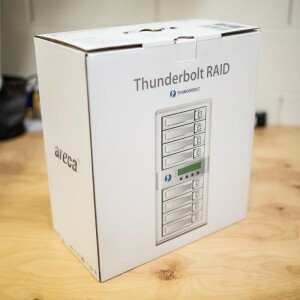 Our first attempt at RAID 5 with factory defaults and using their Quick Function > Quick Create option was not successful. The ARC – 8050 would start to initialize for an hour or so then freeze at exactly 5.6%. 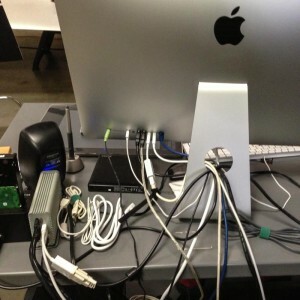 The box would freeze and crash the iMac. Fun. Now this product just started shipping so they will get cut some slack. The problem was also resolved quickly. See below. Long story short, after emailing Areca’s tech support over then next couple of days and running some more tests we found a fix. 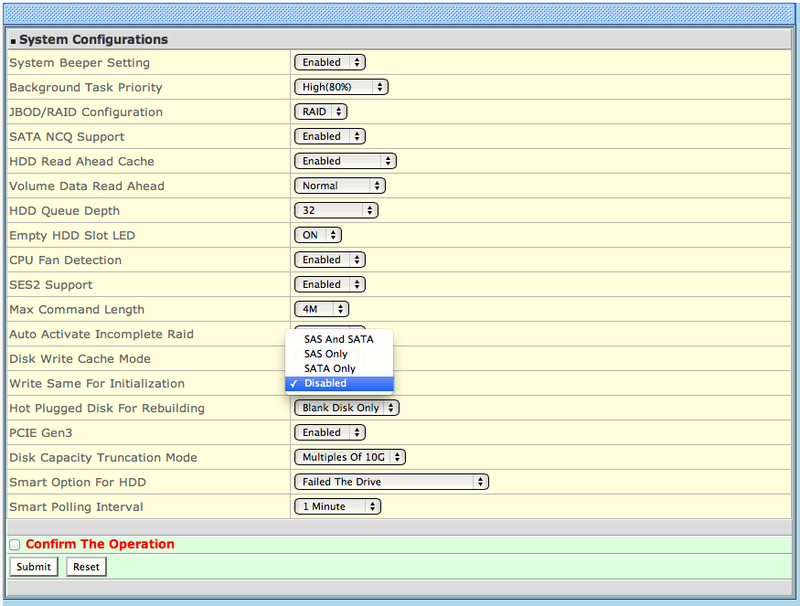 Under System Configurations > Disk Write Cache Mode needs to be set to Disabled, not set to SAS and SATA (which is the default). After changing that it initialized properly the first time and haven’t had any problems since. If you are looking for a fast external thunderbolt enclosure with all of the bells and whistles…this appears to be the ticket…for now at least. 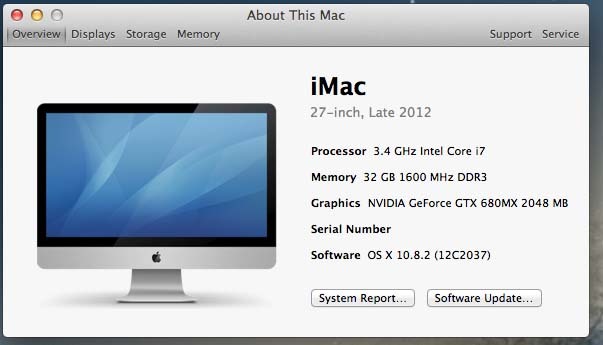 A few months back, we put a new 27″ iMac (late 2012) 3.4 GHz Intel Core i7 model into service at the studio. 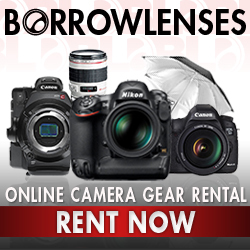 Duties would include tethered capture with Phase One digital backs & Canon DSLR’s as well as various post production tasks – Photoshop, Video Editing, Lightroom, etc. The computer came with a 3 TB internal SATA hard drive. 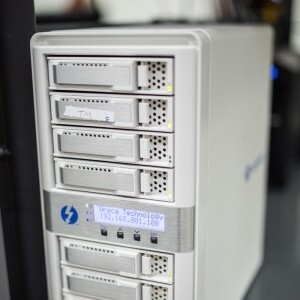 My hope was that with the addition of USB 3.0 ports and Thunderbolt we would have plenty of reasonably priced options to choose from for some additional storage needs. Well, that was easier said/thunk than done. Pretty simple if you want to grab one or two external 3 or 4 TB USB 3.0 hard drives from Western Digital, G-Tech, Seagate, Hitachi, etc. 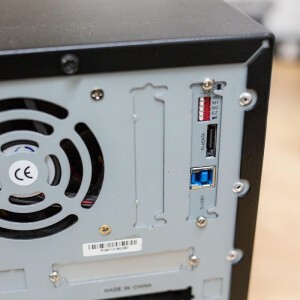 The problem comes when you realize you don’t want to use up all of your USB 3.0 ports on a few drives and or you want to get a serious performance boost. 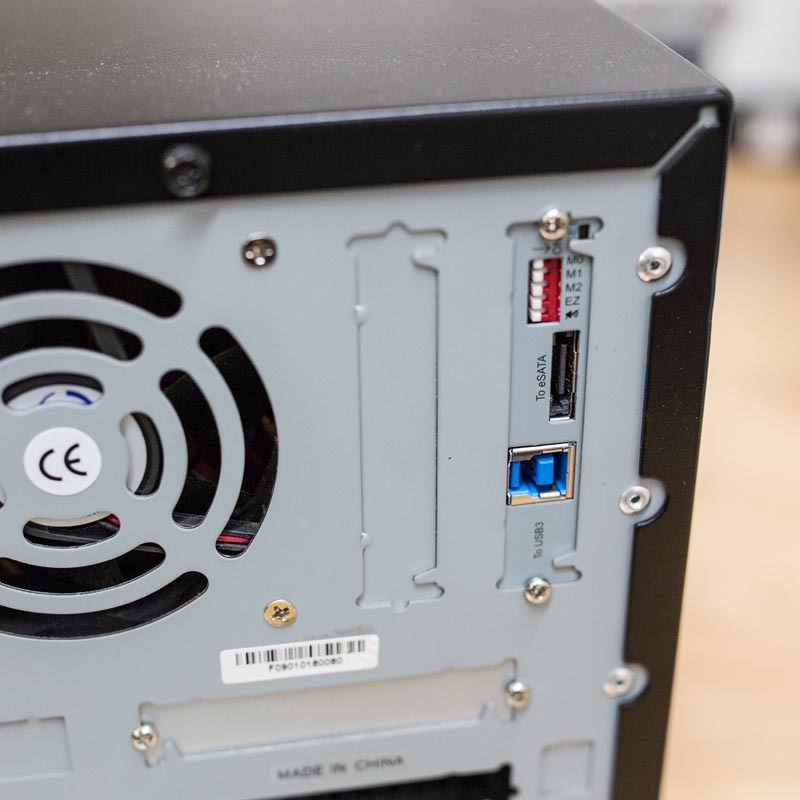 Nice to have at least one port free for connecting flash card readers, monitor calibrators, tethered capture, wacom tablet, etc. 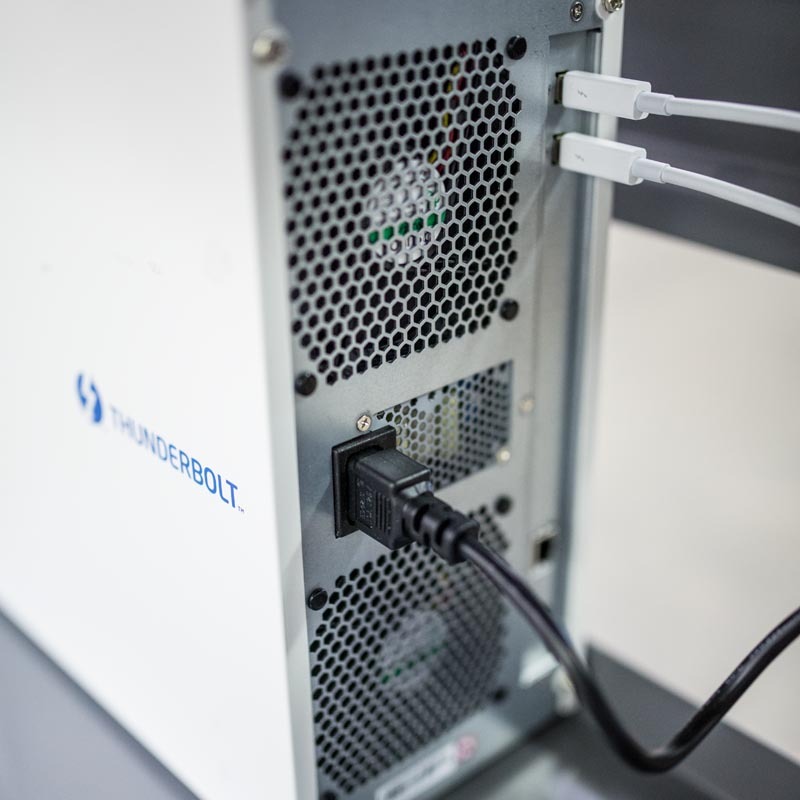 There are of course the Thunderbolt ports, but even thought they’ve been around for over 2 years, there is still a pretty weak selection to choose from. 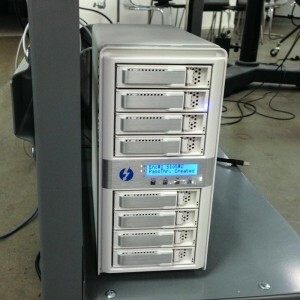 And most are still quite expensive compared to a similar drive in a USB 3 package. I know some of you are thinking, why didn’t you just go buy a Mac Pro? A few reasons. Though they just announced a new one, it hasn’t had a refresh in a long long time. And as of late 2012 there was no Mac Pro with USB 3.0 ports and they are more expensive. 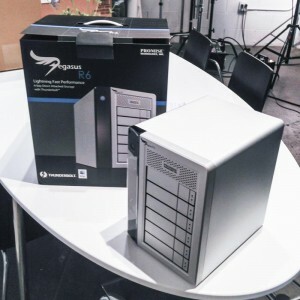 For this machine whose primary purpose is an image capture station…a fully loaded Mac Pro seemed like overkill. Plus, on a big shoot its much easier to bring the iMac along. I will comment on the new Mac Pro announced today in the future. Ideally at a minimum, this machine would have a separate reasonably fast volume for each of the following: OS, scratch, working files (stills and movies), Time Machine and a swapper backup drive bay. The following are a few options tested. Showed up and looked nice. As always I read the instructions, check firmware, current software, updates, etc. I could write a short story about what it was doing but don’t want to take all day. In short, it seemed possessed. Throwing multiple error lights, telling me it was overheating, etc. Spent hours trying to make it right…gave up and sent it back. Nikon D810 – So…What’s Coming from Canon??? All reproductions of photographic images or other artwork created or owned by Jordan Reeder (Reeder Studios, LLC) appearing on this website are copyright Jordan Reeder (Reeder Studios, LLC) 1998-2012. All Rights Reserved. The material on this website may not be reproduced, displayed, publicly performed, reset, adapted, proxy cached or otherwise used in any way by any person or entity except with the prior express permission of Jordan Reeder (Reeder Studios, LLC). All Rights Reserved.